Edward D. Alfriend was the son of Dr. William L. Alfriend (1811-1880?) of Sparta, Georgia, and his wife, Sarah Frances Dunn (1825-1900). Note that there are several Alfriend families in Virginia and Georgia at this time, including Dr. Edward Walter Alfriend (1822-1887) of Athens, Georgia, and playwright Edward M. Alfriend (1837-1901) of Richmond, Virginia, which complicates research on the U.Va. student. When the Civil War began, Edward enlisted as a private on 15 July 1861 in Company E, 15th Regiment, Georgia Infantry—“the Hancock Volunteers.” In 1862, he was wounded in the battle of Malvern Hill. He was promoted to 1st Lieutenant on 26 Oct. 1863, and was with Lee at the surrender on 9 April 1865 at Appomattox Court House, VA. He attended the University of Virginia in session 43 (1866-1867) and took classes in Chemistry, Medicine, Physiology & Surgery, Anatomy, and “Demonstration” (probably demonstrations in the Anatomical Theatre). Edward D. Alfriend practiced as a doctor in Sparta, GA, “a very popular and skilled physician.” (Atlanta Constitution, 1887) He married Mary Susan Pierce (b. 1845) on 14 Dec. 1869, but their only child died at a year old. (“Georgia, Marriages, 1808-1967”). He was buried in Sparta Cemetery, in Sparta, GA. Though E. D. Alfriend’s birth date is given as Mar. 11, 1842 on his tombstone, the information in the U.Va. Matriculation Book gives his birth date as in December 1842, possibly the 6th. I will note that this information was written in the Matriculation Books by the student himself, therefore the information is as correct as possible. Dr. W. L. Alfriend’s tombstone gives his year of death as 1879. However, he is recorded as living in Sparta, GA, on 1 June, 1880 in the 1880 U.S. Census. Ancestry.com. 1850-1900 U.S. Census. [database on-line]. “Death of Dr. Alfriend; A Prominent Physician of Sparta Passes Away.” Atlanta Constitution, July 20, 1887. “Georgia, Marriages, 1808-1967,” index, FamilySearch (https://familysearch.org/pal:/MM9.1.1/FWH8-25Z : accessed 19 May 2013), E. Dudley Alfriend and Mary S. Pierce, 14 Dec 1869. “Georgia, Marriages, 1808-1967,” index, FamilySearch (https://familysearch.org/pal:/MM9.1.1/FW3B-RYS : accessed 19 May 2013), William L. Alfriend and Sarah Frances Dunn, 22 Feb 1842. Historical Data Systems, comp. American Civil War Soldiers [database on-line]. Provo, UT, USA: Ancestry.com Operations Inc, 1999. “[Marriage announcement]” The Southern Christian Advocate, March 11, 1870. William L. Arnell was the son of James Morrison Arnell (1808-1850) of Maury County, Tennessee, and his wife Jane Frierson Mayes (1805-1854). Rev. Arnell was born in Goshen, New York, and served as the pastor of Zion Presbyterian Church in Maury County from 1832 to 1850. Arnell tombstones, Zion Presbyterian Church Cemetery, in Zion, Maury County, Tennessee. Findagrave.com. Garrett, Jill K. & Marise P. Lightfoot, compilers. Maury County Chancery Court Records, 1810-1860. V.1, p. 6. 1965. Garrett, Jill K., editor. Confederate soldiers and patriots Of Maury County, Tennessee. 1970. Lightfoot, Marise P. & Evelyn B. Shackelford. They passed this way; Maury County, Tennessee, cemetery records. Published by the authors, 1964. “Maury County Court Minutes.” Historic Maury. Published by the Maury County Historical Society, Columbia, TN. v. 7, no. 2 (1971). Polk, William R. Polk’s folly ; an American family history. New York, Random House, 2000, p.270. Schele de Vere, Maximilian. 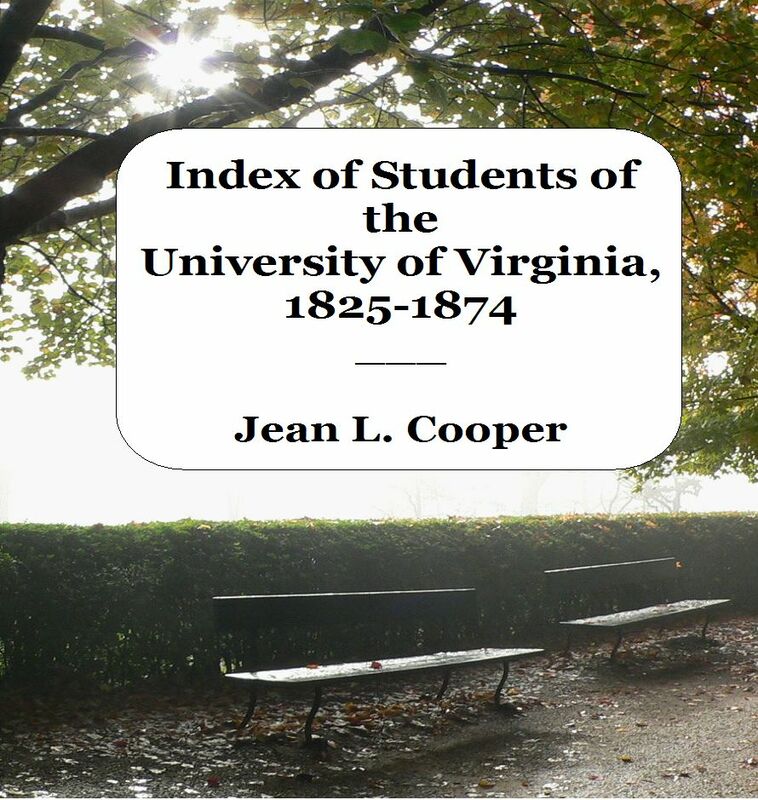 Students of the University of Virginia; a semi-centennial catalogue. Baltimore, MD, 1878. “United States Census, 1850,” database with images, FamilySearch (https://familysearch.org/ark:/61903/1:1:MCD5-RHH : 12 April 2016), Samuel M Arnell in household of Jane Arnell, Maury county, part of, Maury, Tennessee, United States; citing family 982, NARA microfilm publication M432 (Washington, D.C.: National Archives and Records Administration, n.d.). “United States Census, 1860”, database with images, FamilySearch (https://familysearch.org/ark:/61903/1:1:M8TV-N5V : 26 July 2017), W L Arnell in entry for O H P Bennett, 1860. Zebley, Kathleen R. “Unconditional Unionist: Samuel Mayes Arnell and Reconstruction in Tennessee. Tennessee Historical Quarterly v.53, no.4 (Winter 1994), p. 246-259. The July 31st date of the Alexandria newspaper article indicates that the date given on his monument (August 2nd) is incorrect. He is buried in Loudon Park Cemetery, Baltimore, Maryland. (Findagrave.com) He died unmarried and without children. [Advertisement for Milton Academy.] The Baltimore Sun, Sept 1, 1881, p. 2. “Died at sea.” Alexandria Gazette and Virginia Advertiser (Virginia), 31 Jul. 1897, p. 2. Kauffman, Michael W. American Brutus: John Wilkes Booth and the Lincoln Conspiracies. New York: Random House, 2004, p. 88. “Thomas Gorsuch Dead.” Evening Star (Washington, D.C.), 31 Jul. 1897, p.2. “Thomas Gorsuch’s Death.” Sun (New York), 8 Aug. 1897, p.2. “United States Census, 1880,” database with images, FamilySearch(https://familysearch.org/ark:/61903/1:1:MN31-8M8 : 13 August 2016), Thomas Gorsuch in household of Dickinson Gorsuch, District 8, Baltimore, Maryland, United States; citing enumeration district ED 241, sheet 122D, NARA microfilm publication T9 (Washington D.C.: National Archives and Records Administration, n.d.), roll 0496; FHL microfilm 1,254,496. “Mississippi, Marriages, 1800-1911,” index, FamilySearch (https://familysearch.org/pal:/MM9.1.1/V28P-9SM : accessed 4 March 2015), Thomas J. Adams and Ellen E. Cooke, 17 Dec 1860; citing Warren, Mississippi; FHL microfilm 886,049. Thomas J. Adams tombstone, Raymond Cemetery, Raymond, MS. Findagrave.com. “United States Census, 1850,” index and images, FamilySearch (https://familysearch.org/pal:/MM9.1.1/M4L8-M4X : accessed 4 March 2015), Thomas J Adams in household of Thomas Adams, Jefferson county, part of, Jefferson, Mississippi, United States; citing family 88, NARA microfilm publication M432 (Washington, D.C.: National Archives and Records Administration, n.d.). “United States Census, 1870,” index and images, FamilySearch (https://familysearch.org/pal:/MM9.1.1/MF33-YNG : accessed 4 March 2015), Thos J Adams, Mississippi, United States; citing p. 32, family 208, NARA microfilm publication M593 (Washington D.C.: National Archives and Records Administration, n.d.); FHL microfilm 552,225. “United States Census, 1880,” index and images, FamilySearch (https://familysearch.org/pal:/MM9.1.1/M4GZ-PNS : accessed 4 March 2015), Thomas J Adams, Utica, Hinds, Mississippi, United States; citing enumeration district 9, sheet 235B, NARA microfilm publication T9 (Washington D.C.: National Archives and Records Administration, n.d.), roll 0648; FHL microfilm 1,254,648. “United States Census, 1900,” index and images, FamilySearch (https://familysearch.org/pal:/MM9.1.1/M96T-4LX : accessed 4 March 2015), Thos J Adams, Beat 4 (part of) Raymond town, Hinds, Mississippi, United States; citing sheet 1A, family 5, NARA microfilm publication T623 (Washington, D.C.: National Archives and Records Administration, n.d.); FHL microfilm 1,240,810.